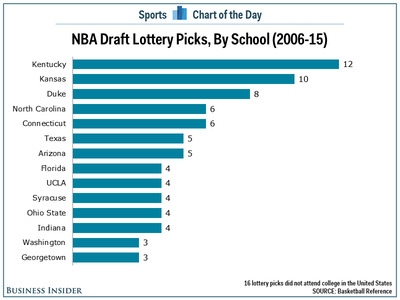 The State of North Carolina is the home of college basketball but Kansas and Kentucky are the homes of lottery picks. Over the last 10 drafts, 12 players from the University of Kentucky were selected among the top 14 picks in the draft, and ten players came from the University of Kansas. If we include players from Duke (8), those three schools are responsible for 21.4% of all lottery picks in the last decade.